One of the applications that you may not have thought about when it comes to virtual reality is its use in retirement homes. The fact is, virtual reality is going to change everything and that includes medical applications. That’s exactly what researchers are looking at right now when it comes to retirement homes in care facilities. That’s because virtual reality can re-create environments that can trigger memories and increase the quality of life by a significant factor for seniors who are living in those facilities. Even when you are at the prime of your life, memories can still be hazy. But during the aging process, memories can be very fuzzy and hard to access. The more of these memories that go, the harder it is to recall anything related because you lose all of the trigger memories that you have. Sometimes, a photograph or song can bring back some of those memories, but in the advanced aging process, even these triggers may not be enough. That’s why aging experts and researchers are turning to virtual reality to see if a more immersive environment can trigger these memories. So far, the results have been extremely positive. One of the questions that researchers are trying to answer is whether or not dementia and Alzheimer’s disease are part of the normal aging process or whether something can be done to combat this. Aging disorders are part of one of the largest clinical populations globally, and there are many scientists dedicated to finding out whether or not these aging disorders can be cured – or at the very least, put off for as long as possible. But how does a virtual reality help with that? “Virtual Reality-based cognitive rehabilitation systems support procedures for mitigating behavioral and psychological symptoms of patients having mild cognitive impairment and early-stage Alzheimer’s disease,” says the American Journal for Alzheimer’s Disease and other Dementias. 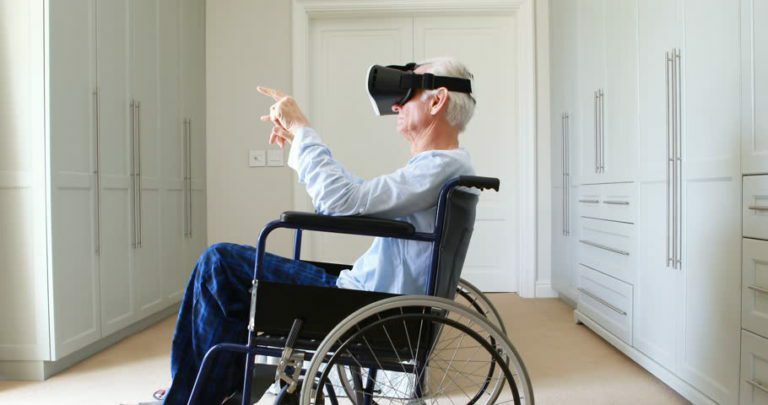 While this is certainly not proof that virtual reality will change the way that aging disorders are treated or that the numbers of elderly people affected with them will decrease, it does give hope to the millions who suffer from these aging disorders in families that have to watch their loved ones go through it. What can be said about how virtual reality is currently able to affect Alzheimer’s and dementia is that memories may be triggered using the virtual reality environment. This is something that has been seen over and over in retirement homes in care facilities. The way that it normally works, is by using video to create a virtual reality environment that stimulates the memory centers of the brain because it either is an actual experience that the person with the aging disorder had at some point in their life, or it is similar enough to that experience that they had in order to trigger memories. For example, some caregivers are using home videos procured from family members in order to create a virtual 3D environment for the patient to interact in. That means that the patient is put in a virtual environment that they can almost believe is real. In fact, with some dementia patients, they may not be able to tell the difference between reality and virtual reality. Of course, this is still considered therapeutic because they are able to trigger memories and forge connections in the brain that may be able to bring their current actual reality back into focus and inhibit the symptoms of Alzheimer’s and dementia that they are currently experiencing. Most people think about virtual reality is something that millennials are going to be using in droves. While that is undoubtedly true, there are a lot more applications for virtual reality than most people think. For example, while some millennials are playing games and exploring new environments with their VR headsets and treadmills, other millennials will be using virtual reality to attend college courses, get hands on training with things like surgery, mechanics and much more. But they will not be the only ones using this technology. In fact, even those in retirement homes will not be using virtual reality solely to combat dementia symptoms. Take seventy-eight-year-old Craig Palmer. The retired singer and actor is not able to get out much anymore. In fact, he has been forced to live inside his Manhattan apartment for the past four years. But even so, Palmer has recently had the opportunity to visit a favorite vacation spot at Russell Sq. in London, look around backstage at nightclubs where he spent years working in go to places that he did not have the opportunity to experience in real life but where he can go via virtual reality and get a very close approximation of the experience. This is where the field the virtual reality is going for those who are homebound or stuck in retirement homes or care centers. Science may not have come up with a way for them to reverse the symptoms of aging and travel without risking their health, but virtual reality affords them a quality of life that they never could have imagined. Consider a family that lives halfway across the world wanting to share their Thanksgiving dinner or a child’s birthday party with an elderly loved one who is not able to leave the retirement home that they live in. With virtual reality, the family could simply use a phone or any video camera to film the birthday party or other event from the “perspective” of that housebound loved one and then translated into a virtual reality experience that makes them feel as if they were there in real life. This is something that is making many seniors extremely happy, affording them the opportunity to be part of their children and grandchildren’s lives in a way that they never could before – and in a way that pictures and video simply do not provide.